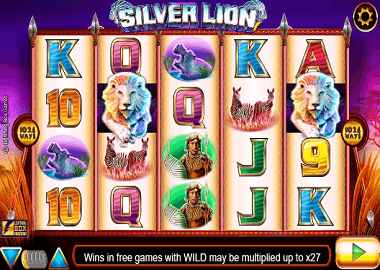 The Silver Lion Slot is a 1024 ways to win game from the Australian software company Lightning Box Games. Your ways to win are on five reels with four symbols. In contrast to “paylines”, in “ways to win” the same symbols only have to end up side by side on the reels. Only the highest winning combination is paid. Lightning Box Games also released other ways to win slots like Blazing Goddess or the Redroo Slot. The Silver Lion Slot has a Safari theme and offers all sorts of bonus features like Free Spins, Multipliers and Wild Symbols. Symbols and payouts: The symbols on the Silver Lion slot are playing cards symbols and themed symbols. The playing cards 9, 10, J, Q, K and A are low paying symbols. The 9 and the 10 pay 100x your bet with a combination of 5 equal symbols. J and Q pay 120x your bet and the K and A 140x your bet. If the 9 lands on your reels, you can already make a profit with only 2 equal symbols. Themed symbols are meerkats, a rhinoceros, zebras and a Masai warrior. Here you can expect winnings up to 200x your bet with 5 symbols. The Silver Lion symbol is the most valuable symbol with winnings up to 250x your bet. Free Spins with instant Wins: The Free Spins feature is the highlight of the Silver Lion Slot. You can trigger up to 20 free spins. The scatter symbol is the red diamond. With 3 Scatters you get 8 free spins and an instant win of 80x your bet. 4 red diamonds mean 15 free spins and a win of 400x your bet. If you manage to land 5 red diamonds on your reels, you will receive 20 free spins and a top win of 800x your bet! Re-trigger Free Spins with Multipliers: So far, you have not played any free spins, because you can expect another surprise with this feature. First, you can extend the feature with 2 more scatter symbols. You get 5 free spins each time. During Free Spins each Wild Tree symbol that appears on reels 2, 3 and 4 will multiply any prize to a maximum of x27. This way and with a maximum bet of up to £280 you can grab a huge win in Free Spins! Slots from Lighning Box Games are particularly popular in Australia and New Zealand. There are a number of well-known online casinos offering these games. The Spinland Casino, Miami Dice or the Spin Rider Casino are good recommendations. In each of the casinos you can also test the games for free. Bonus offers and free spins can be redeemed when registering. If you want to test the Silver Lion Slot, you can click on the banner at the top. Here you can play the slot as long as you like without deposit.